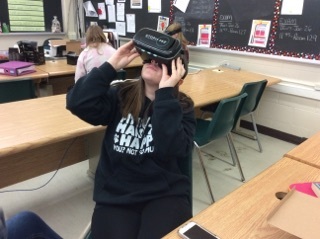 Ms. Kleinsteuber’s Grade 9 English class experienced stories and settings using virtual reality goggles. They said they felt like they were in the world, feeling the emotions and interacting with the setting. “It was amazing! It was realistic and you felt like you were actually there. I didn’t think it would work that well,” said Matthew. It was just as fun to watch students’ reactions while they were in the virtual reality world!